Semester one complete and much work done too. And I am not stopping just because I have no access until January. 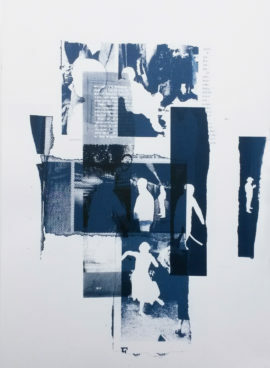 There is sketchbook work I want to do, reflecting on practice, and I can prepare new work stencils etc. Students came in during the final week inviting me to see their work on display in another room ready for assessment tutorials. I talked to a few students about their work and found much of interest. 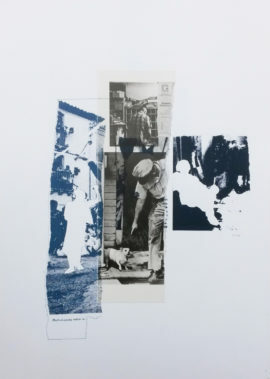 So I guess I am settled in and established here in the residency, a very enjoyable new venture out of the print room. I also met Vicky Cull who is leading the fine art now and building the program a bit more for next semester. I was asked to give a talk, probably in week 5, along with providing tutorials and talk of an exhibition. I will look forward to the talk and tutorials, because after teaching in further education for so long on BTEC and Foundation courses, it will be interesting to find out more about what the students at this level. 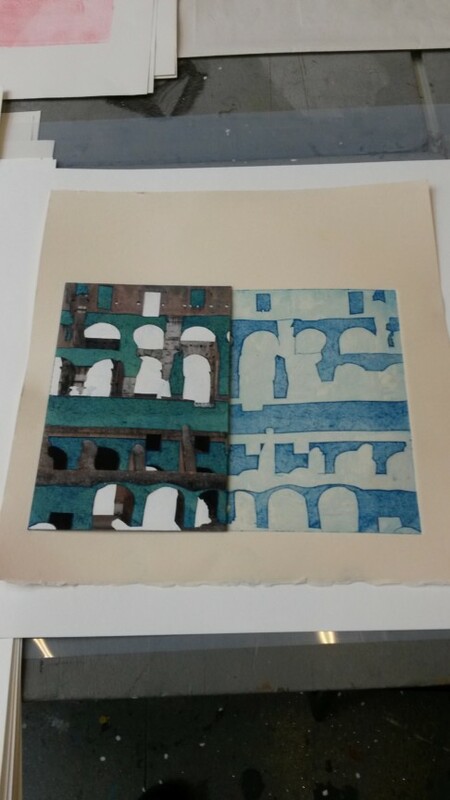 So far students visiting the print room have been very thoughtful about their work. I like the level of engagement students at this level have. Fine art and graphic students have discussed their work with me in the print room. Many students from the graphics course talked to me in the print room last Tuesday about their work, as they were completing printing for final pieces. Too many to mention, but the student making a set of cards to promote fungi made some interesting designs, another took painkillers for a subject; really, some unlikely but interesting ideas. 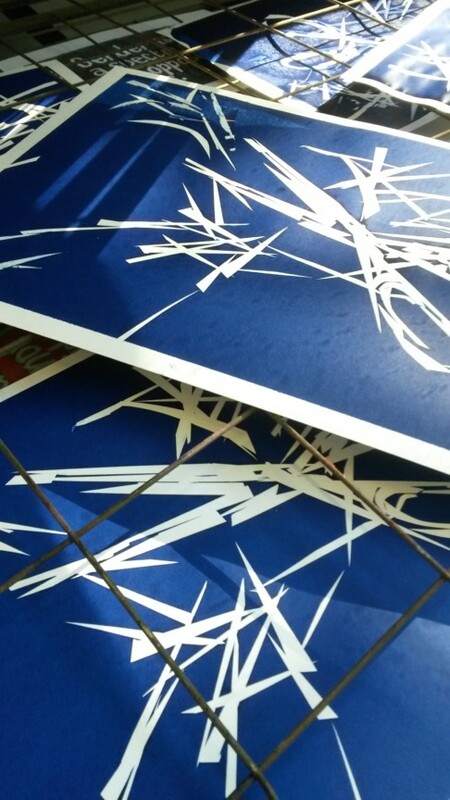 My Simulacrum Series is building up well, though I did have problems with one of the screens. Must sort that problem out. 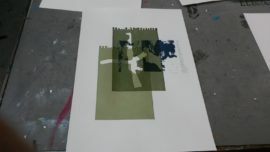 I have uploaded a double image here of work in progress and a single image completing one of them. 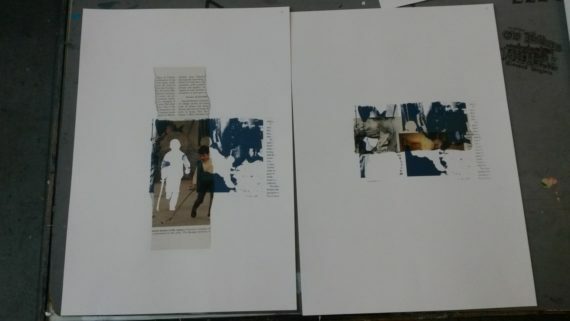 I have several ‘secondary’ series now with no collage fragments all in blue and my first ‘Devices’ print using the reporters notebook stencil printed in transparent green, is nearly done. I think that I can rework that idea further and make a series from that as well. 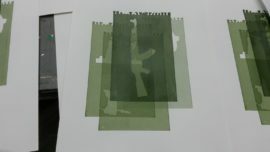 The Devices stencil worked also in another application with the photo-screen newspaper image which fixes the signification more than the main series of simulacrum. I will reflect in my sketchbook and clarify ideas over the next couple of weeks, and upload that, while also doing prep work for January. 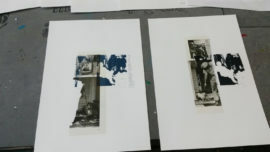 I have the original print installation series on track and can envision the way it will work in exhibition, and I can see how the secondary series of prints will relate to each other and the main series in exhibition. I think I will start designing layouts quite soon as the concepts are established and I think that a dialogue can be woven between each different series.